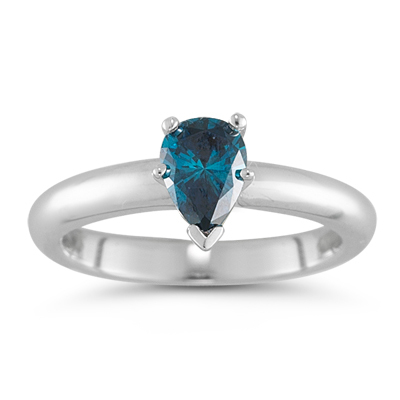 0.53 Cts Teal Blue Diamond Solitaire Ring in 14K White Gold . This spectacular Teal Blue Diamond Solitaire Ring exhibits a SI quality pear-shaped Teal Blue Diamond prong set in 14K White Gold. Approximate Gemstone Weight: 0.53 Carats. This ring abounds extraordinary elegance. The Total Gold Weight of the Ring is 2.85 Grams.